White Paper Abstract: Montefiore Health System’s two-tiered assessment screening program to measure social determinants of health (SDOH) positivity in its predominantly high-risk, government-insured population is inspired by existing initiatives within its own organization. 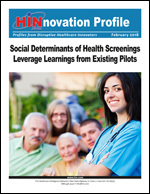 Download this HINnovation profile to learn more about Montefiore's SDOH screening rollout. Subscribe to the Free ‘HIN Weekly Update’ e-Newsletter and receive the latest trends, news and analysis in healthcare.